Published: Thursday, August 4, 2016 at 12:01 a.m.
Last Modified: Tuesday, August 2, 2016 at 9:13 p.m. 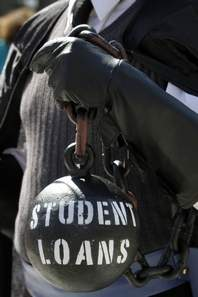 In May 2014 U.S. Rep. Dennis Ross told those listening to a "teletown" hall meeting that if college students can't repay their loans from a private bank, we should “go back” to our prior laws and allow them to declare bankruptcy. “If a student does file for bankruptcy [under current laws], they can have all other debt discharged — but their student loans. So, we're not really doing a good service ... by making them over-indebted for their education,” Ross said at the time. Ross breaks ranks with the typical GOP opinion with this candid admission. For example, HR 1674, the Private Student Loan Bankruptcy Fairness Act of 2015, a bill introduced in March 2015 by Rep. Steve Cohen, D-Tenn., that would allow bankruptcy proceedings for student loans has 40 co-sponsors, all Democrats. Typically, most or all cosponsors of such bills are Democrats. But both parties are reluctant to allow bankruptcy discharge for college loans as regularly happens with credit card users, banks, or the über-rich. Although Ross made these statements two years ago, he has yet to introduce bills offering relief to suffering students. This is troubling because Ross claims to support such an idea, yet hasn't acted on his belief. He acknowledges that college loans deserve bankruptcy, but has yet to introduce or cosponsor such legislation. Does he only represent the rich? Not only would bankruptcy — and other standard consumer protections, like truth in lending, refinancing and statutes of limitations — help struggling college borrowers, they would scare off lenders, resulting in sharp declines in tuition. Actually, making college loans equal to credit card loans would extend to them all standard consumer protections. Ross should cosponsor bills like HR 449, the Discharge Student Loans in Bankruptcy Act of 2015, which, surprisingly, has bipartisan support, and which would allow borrowers to discharge private loans as well as those from nonprofits and government. Then, Congress should pass a bill reversing the obscene increases in college loan limits as allowable by the College Access and Opportunity Act of 2005, a bill introduced by former Speaker John Boehner, which was the cause of this crippling and massive college debt, and benefited only the banks and universities. When colleges and universities knew students could take out “deep pockets” loans, they jacked up tuition in response to the additional money available, thereby fueling tuition inflation and proving former Education Secretary Bill Bennett's hypothesis: When you subsidize anything, price goes up. However, he has yet to introduce a bill that does this. So, please end all higher education loans. American colleges in the 1950s and '60s were the best in the world without the need for loans. We can do without loans today. Many experts, such as former Congressman Ron Paul and Bennett, agree that we shouldn't even have college loans in the first place. When universities see subsidies, they increase tuition simply to pay for big-dollar salaries. This costs students skyrocketing tuition and taxpayers, who back these loans. For those who think I'm asking for a liberal, free handout, remember college used to be free in America, and currently is free in many technologically advanced countries, including Germany. Indeed, liberals have a strong argument for free college, since an uneducated, debt-burdened populace threatens our national security. So, if a strong argument exists for free college, how much more indefensible is it to deny the modest reforms I've suggested? Students are told from their youth that they need an education to compete in today's world. Let's not punish them forever for doing what is right. So, I ask Congressman Ross to introduce legislation that represents the 99 percent, not the rich 1 percent — legislation that simply makes college loans “equal” in all respects to credit card loans. Once that is done, end this wicked college loan system. We never needed it in the past, and we need to end this new form of debt slavery. Slavery was wrong in the past, and it's wrong now. It must stop. – Gordon Wayne Watts (contact him at GordonWatts.com or GordonWayneWatts.com) is a Lakeland resident and a former candidate for the Florida House of Representatives.